The oldest parts of this building date from the 16th century. Now a country hotel, it was previously the home of Llangattock’s rectors, who led services in nearby St Catwg's Church. In the 17th century, the poet Henry Vaughan (1621-1695) lived here as a young pupil of rector Matthew Herbert. Henry, born in 1621, belonged to the family which owned Tretower Court. He may have fought for the Royalists during the Civil War. He is widely regarded as the finest Welsh poet of his time. His love for the Usk Valley’s landscapes and wildlife colours many of his works. The puritanical authorities removed Matthew Herbert from the living of Llangattock as the war came to a close. Llangattock’s rectors were appointed by the head of the Somerset family, latterly the Duke of Beaufort, from 1555 until the Church in Wales was disestablished in 1920. The rector from 1812 to 1851 was Lord William Somerset, one of the Duke’s sons. The Rev Richard Cole-Hamilton (pictured right) became rector of Llangattock and Llangenny in 1913. Two years later he became an army chaplain. A locum took his place during his postings over 12 months to Egypt and the Dardanelles, where Allied forces suffered heavy casualties in their futile attempt to invade Turkey through the Gallipoli peninsula. Having survived the dangers without injury, he was involved in a serious car accident in February 1916 – while at home on leave! He left for Egypt soon after. Later in the war, he lectured on his experiences to raise funds for Welsh troops. He co-founded the Llangattock Old Comrades’ Association after the war. In 1918 Richard’s brother Charles stayed here after three years as a chaplain in Palestine and France, where he suffered gas poisoning. Charles received the Military Cross in 1919. 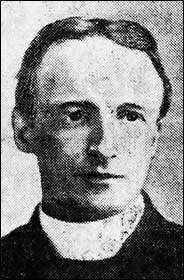 Their cousin CG Cole-Hamilton, chief constable of Breconshire, was also decorated for his war service. Richard and his wife Margaret lost a son and a daughter in the Second World War. The old rectory was replaced by a smaller one in 1950.